If you have leaky walls and/or floors in your basement, basement waterproofing is the first line of defense against a wet and musty basement. If your basement is wet, it is important to address the issue immediately, otherwise you run the risk of mold growth, damaging your basement and even comprising the structural integrity of your home. When it comes to basement waterproofing, there are a number of different methods that can be used, both inside and out. Ultimately, the method used depends on the cause of your wet basement (cracking basement walls or improper backfilling, for example). Some homes require a mix of basement waterproofing methods. Interior basement waterproofing ranges from primers and paints to crack injections. 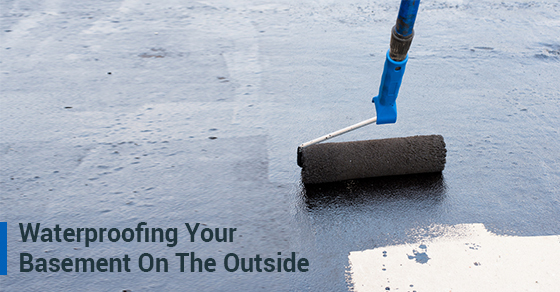 However, some of the most effective and long-lasting waterproofing methods include exterior basement waterproofing, which we will detail below. One of the best exterior waterproofing methods is the French drain. It’s simple and cost-effective, because it doesn’t require a lot of installation, and will last a very long time. In short, the process involves digging a trench alongside your home and then placing a drainage pipe inside. Gravel is then placed over the drainage pipe. French drains work by collecting ground water and then diverting this water away from your home. When it comes to a basement waterproofing service, this is one of the best you can choose. Sometimes, the source of water seepage is cracks in the basement wall, which can be caused by several different things, including the process of foundation settling. While interior injections are usually the answer in this case, sometimes access to the cracks is blocked, meaning that exterior crack repair is needed instead. This method involves digging a hole next to the crack – a hole that extends to the bottom of the foundation. Then, the hole is filled with granular clay, which absorbs water to become plastic, forming a barrier against any water. You can also add extensions to your downspouts to ensure that water is deposited farther away from your home, preventing water from seeping into the soil and into your home through the basement window seals or other possible points of entry. If your basement is leaking and you are in need of a professional basement waterproofing service, contact Brothers Plumbing today. With over 50 years in the industry, we are one of Toronto’s leading plumbing providers. Our basement waterproofing service uses some of the most advanced technology to protect your basement. We also offer very affordable rates.